At LCI Paper, getting the right colored envelopes for invitations & weddings is easy, convenient & fast, whether you want them blank to print at home or professionally printed by us. Not only do we offer complete printing services, but we can print in white ink on all the dark colored envelopes in this collection. Imagine red envelopes printed in a crisp white ink, just awesome! After you upload your files we can print and ship your envelopes in 48 hours. Color, finish, size, weight & flap style does make a difference, that's why our selection is huge & beyond compare. 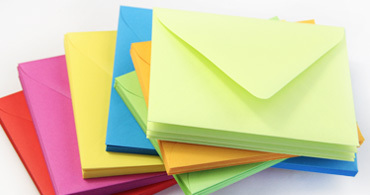 If you are using colored envelopes for weddings (yes you can do that!) you want to be sure it meets your expectations. No longer is traditional white & ecru the only option for weddings, so look around & find the right one. Color is in, show your style! Did you know that the most common envelope size is A7 (5 1/4 x 7 1/4), the perfect fit for 5 x 7 cards. That's why we offer just about every color imaginable in this envelope size. So find yours now, and use them for a sweet sixteen, greeting cards or a girl's night out invite. Want further savings, order in bulk at wholesale prices. 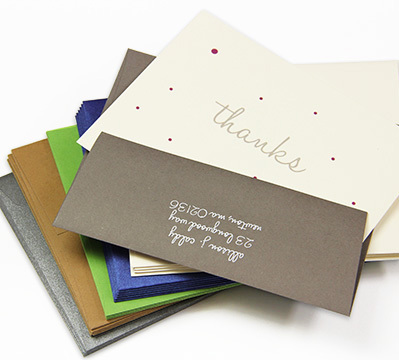 Click to shop the full collection of colored paper & colored card stock sold through LCI Paper. There's nothing more striking than a rich black invitation envelope, especially when it is printed with bright white text! 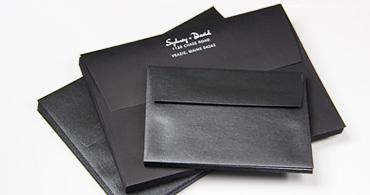 Shop black envelopes in several finishes and flap styles for your invitations. Navy, royal, sky, turquoise - if it's blue envelopes you're after, you've come to the right place. 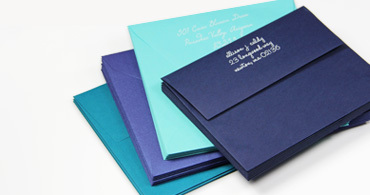 We offer blue envelopes in a variety of sizes, shades and styles, all in stock, all blank or printed. Browse brown envelopes in shades light and dark, finishes smooth, coated, and textured, and in all the popular sizes you may need. Which one is your favorite? 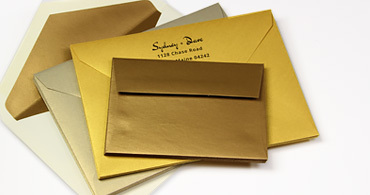 For the most opulent of affairs, we offer shimmering metallic gold and gold lined invitation envelopes in oh so many shades and styles for your elegant design. 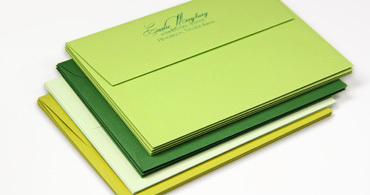 From mint, to teal, to kelly, to neon, we offer a full spectrum of green invitation envelopes for your next fun and funky design, all with matching card stock, of course. Neutral, versatile, and always in vogue, our matte grey envelope collection spans multiple finishes, formats, and flap styles so you can find the perfect grey envelope. Clean and classic, you can't go wrong with an ivory envelope. Choose from metallic, matte, and linen options, a slew of sizes, and several different flap styles. Fun and funky orange envelopes are sure to stand out in a mailbox! 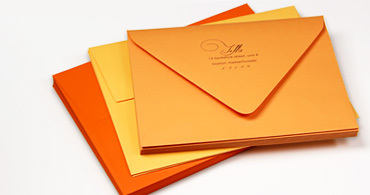 Shop orange envelopes in all shapes, sizes, and shades, blank or fully addressed - how convenient! From soft pastels to bold neons, classic mattes to modern metallics, flaps pointed and square, we offer a full gamut of pretty pink envelopes - great for weddings, parties, and showers. 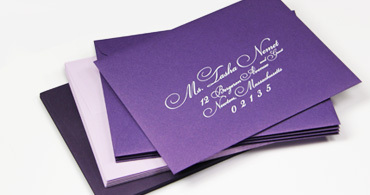 Lilac, lavender, plum, eggplant - you name it, we have it in our purple envelope collection. Choose from lined and unlined options, each with matching card stock. 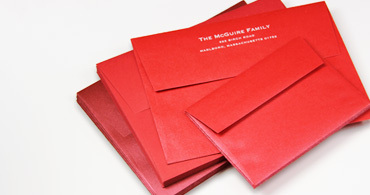 Red invitation envelopes are perfect for wedding, party, and holiday invitations alike. Order blank or printed and choose from dozens of premium options. 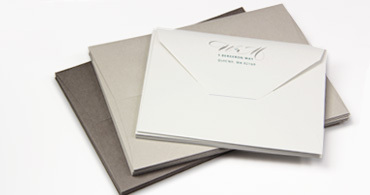 Browse our popular collection of silver metallic and silver lined envelopes for your next elegant event. Choose from shades light and dark for just the right look. 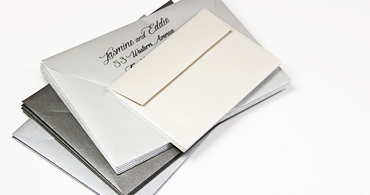 Simple, classic, and versatile, our premium quality white envelope collection consists of lots of finishes, textures, hues, sizes and formats. 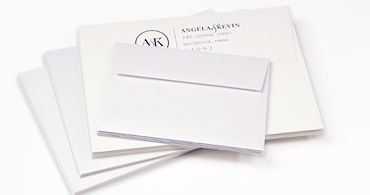 With white envelopes, you just can't go wrong! 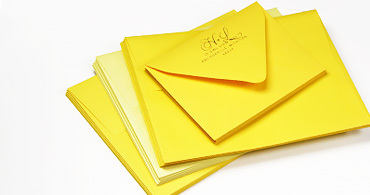 Bright and vibrant yellow invitation envelopes set the tone for a fun event! Choose from several different shades of yellow to complement your stationery scheme. 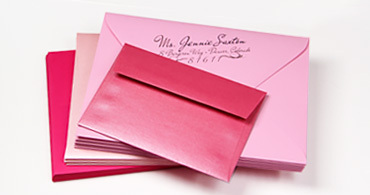 Colored envelopes for invitations & weddings are another way to bring your invites to life. Our quality colorful envelopes are available in a range of weights (68lb text / 101gsm to 91lb text/ 135gsm), different flap styles, 10 sizes & almost 50 different fun and bright colors. Printing at home, not a problem? Our in house print tests have revealed that our colorful matte smooth & eggshell finish envelopes are inkjet and laser friendly. Printers and inks do vary from model to model, therefore we urge you to order a sample to test print prior to purchase. Send your correspondence in the splendor of color. Choose from vibrant solid colored papers, vibrant lined interiors, and even intriguing translucent color envelopes. Your mailings will have an immediate sense of vibrancy. If you're looking for color, you've come to the right place. 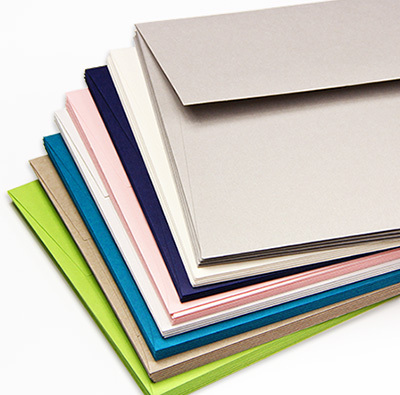 Our envelopes are conveniently presented and include over 50 enticing colorful envelope and liner options. From shades neutral to vivid, finishes metallic to translucent, we have all of your occasions covered - from parties, to wedding invitations to business correspondence and everything in-between. 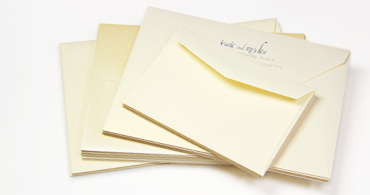 Creating invitations, thank yous, and other correspondence is simple when you pair our envelopes with our variety of specialty papers & blank cards. If we don't have the right card for the envelopes of your choice, don't fret, we also offer a custom cutting & scoring service. 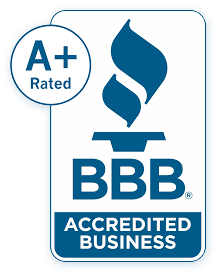 Let us know how we may assist you with your project. 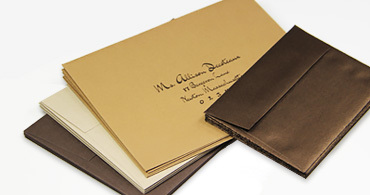 Our envelopes have the finish and weight that silently speaks to their quality. Even before your recipient opens the flap, they'll appreciate the value in their hands.